VANCOUVER, BC--(Marketwired - January 23, 2017) - Midas Gold Corp. (TSX: MAX) (OTCQX: MDRPF) today announced that it has resumed its resource optimization drill program at the Stibnite Gold Project, Idaho. In addition, Midas Gold reported results from holes completed in late 2016 as part of this program, which has the goal of improving, expanding and de-risking the mineral resources defined in the December 2014 preliminary feasibility study ("PFS") before commencing a feasibility study ("FS"); all three of these goals were achieved with these latest results. Assay results have been received for two drill holes completed at the southern end of the Yellow Pine deposit and a third drill hole completed in the central portion of the same deposit. Highlights of the drill holes are tabulated below, while complete results are attached at the end of the press release. (1) The reported drill hole intercept widths are oblique to the mineralized structure. True width is approximately 75-85% of intercept width. (2) Gold composites are generated using a 0.5 g/t Au cutoff grade. Antimony composites are generated using a 0.1% Sb cutoff grade. Composites may include intervals below cutoff grades. (3) Gold equivalent grades are reported for illustrative purposes only and are calculated using metal prices of $1200/oz Au, $17/oz Ag and $7600/tonne Sb and do not include recovery, transportation, refining or payability. These factors will vary for each metal and affect the economic importance of the various metals. Hole MGI-16-415 intersected substantially higher grades than were anticipated (based on legacy underground exploration drilling from the 1940s), while MGI-16-416 was angled obliquely, but missed the target area and will need to be re-drilled at a slightly different angle in order to intersect the target. Hole MGI-16-417 targeted an area with little Midas Gold data, intersected slightly higher grades than anticipated, and verified the location of an important post-mineral structure. "These latest drill results realized all three of Midas Gold's goals for its resource enhancement drill program at the Stibnite Gold Project: expanding the mineral resource, improving confidence in the geological model, and improving margin by identifying higher grade material within the proposed pit limits," said Stephen Quin, President & CEO of Midas Gold Corp. "Hole MGI-16-415 successfully extended the limits of known high-grade gold-antimony mineralization over 50m to the south, in an area within the limits of the 2014 PFS mineral reserve pit limits, but which had been treated as development rock in the PFS. Hole MGI-16-417 generally verified the mineral resource and provided important structural constraints on mineralization." 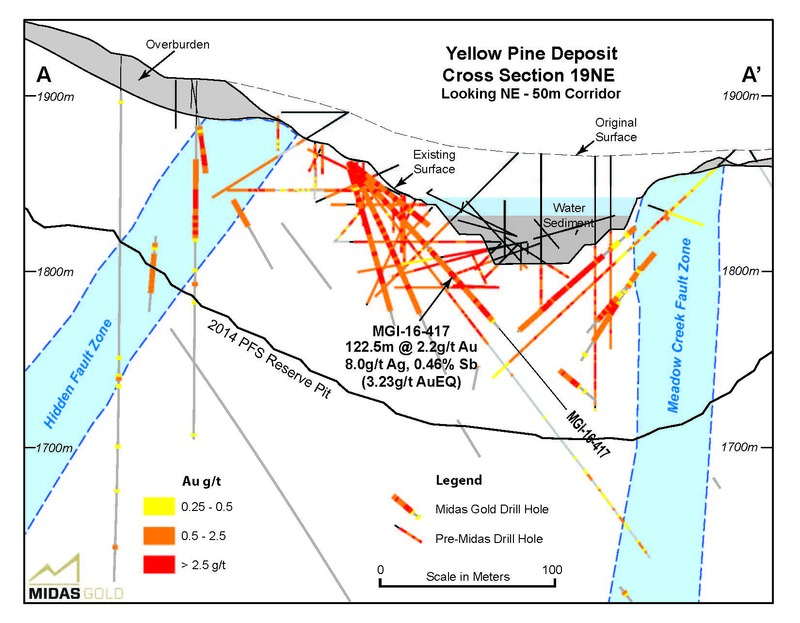 Drilling in 2017, which recently commenced, will be focused on the Yellow Pine deposit, initially following up on encouraging results from MGI-16-414 and MGI-16-417. Additional shallow inclination drill holes are planned to obtain additional data beneath the historical pit lake and to improve understanding of geological controls on high-grade gold and antimony mineralization. The Monday Tunnel was driven in 1928-1932 from the south end of the Yellow Pine Pit along the trace of the Meadow Creek Fault Zone ("MCFZ"), the District scale structure that forms the eastern boundary of the Yellow Pine ore-body. In the 1940s, eight small diameter underground core holes financed by the US Government's Defense Minerals Exploration Agency were completed in this area, focused on exploration for antimony and tungsten. 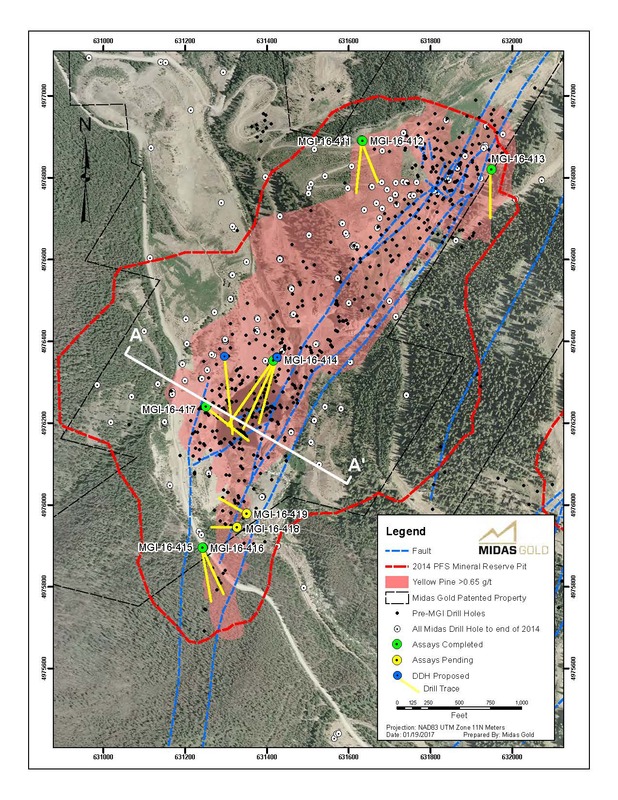 The 2014 PFS geologic model for the southern section of the Yellow Pine deposit was partially based on this legacy underground drilling and the mineralization was modeled as inferred mineralization and subsequently treated as development rock in the 2014 PFS economic model. Drill hole MGI-16-415 returned gold grades approximately twice those carried as inferred mineralization in the 2014 PFS block model (3.12g/t Au in current drilling versus 1.6g/t Au predicted) with substantially higher antimony grades as well. The drill hole intercept was approximately 30% shorter than was predicted in the block model and the differences are likely due to better core recovery and sampling methodology in the modern-era drilling versus the older legacy drilling. "This higher-grade gold and antimony mineralization at the south end of the Yellow Pine deposit represents an economically attractive resource expansion target within and immediately adjacent to the proposed open pit and warrants additional drilling," said Mr. Quin. The second drill hole, MGI-16-416, was drilled in a more southerly direction, sub-parallel to the target zone, but did not penetrate the mineralized corridor of the Meadow Creek Fault Zone. Historical drilling from surface and in legacy underground workings in this area suggest this hole just missed the target. Additional drilling is being considered to intersect and extend the known limits of the mineralized zone farther to the south. Drill hole MGI-16-417 was drilled to obtain additional information beneath the historical Yellow Pine pit in order to replace legacy data and to test for continuity of an important post-mineralization fault in the deposit. The drill hole generally confirmed the grades estimated in the 2014 PFS block model, returning approximately 5% higher gold grades, as well as higher antimony grades. Sub-economic inferred mineralization in the footwall of the post-mineralization fault was not confirmed, which has no impact on project economics. Both MGI-16-415 and MGI-16-417 intersected multiple sets of narrow, high grade antimony veins within broader zones of lower grade stockwork and disseminated gold mineralization. These vein intersections and their orientations are consistent with newly developed geologic concepts for the Yellow Pine deposit that are based on Midas Gold work and age dating studies conducted by researchers at the Idaho Geological Survey and U.S. Geological Survey. This work suggests that the antimony vein systems have overprinted earlier, more disseminated, gold mineralization may be related to a separate mineralizing event. The implications, confirmed by the oriented core data from these holes, also indicate more focused drilling at appropriate orientations may provide evidence for continuity to these high-grade Stibnite vein systems, which can run multi-percent antimony, and could enhance project economics. Details of the previous news releases, the Project and the 2014 Prefeasibility Study can be found filed under Midas Gold's profile on SEDAR (www.sedar.com) or at www.midasgoldcorp.com. To view a cross section and the locations of drill holes reported in this news release, please view images attached. Statements contained in this news release that are not historical facts are "forward-looking information" or "forward-looking statements" (collectively, "Forward-Looking Information") within the meaning of applicable Canadian securities legislation and the United States Private Securities Litigation Reform Act of 1995. Forward Looking Information includes, but is not limited to, disclosure regarding possible events, conditions or financial performance that is based on assumptions about future economic conditions and courses of action including actions taken with the goal of improving, expanding and de-risking previously defined mineral resources; the timing and availability of further drill results; potential sites for additional drilling that could result in potential improved confidence, enhanced economic returns and/or extending higher grade areas. In certain cases, Forward-Looking Information can be identified by the use of words and phrases such as "plans", "expects" or "does not expect", "is expected", "estimates", "forecasts", "intends", "anticipates", "potential", "confirm" or "does not anticipate", "believes", "contemplates", "recommends" or variations of such words and phrases or statements that certain actions, events or results "may", "could", "would", "might" "be achieved". In preparing the Forward-Looking Information in this news release, the Corporation has applied several material assumptions, including, but not limited to, that pending drill results will be available in a timely manner without undue delay; that areas identified as potential sites for additional drilling will yield results consistent with management's expectations based on the PFS; any additional financing needed will be available on reasonable terms; the exchange rates for the U.S. and Canadian currencies will be consistent with the Corporation's expectations; that the current objectives concerning the Stibnite Gold Project can be achieved and that its other corporate activities will proceed as expected; that the current price and demand for gold will be sustained or will improve; that general business and economic conditions will not change in a materially adverse manner and that all necessary governmental approvals for the planned activities on the Stibnite Gold Project will be obtained in a timely manner and on acceptable terms; the continuity of the price of gold and other metals, economic and political conditions and operations. Forward-Looking Information involves known and unknown risks, uncertainties and other factors which may cause the actual results, performance, or achievements of the Corporation to be materially different from any future results, performance or achievements expressed or implied by the Forward-Looking Information. Such risks and other factors include, among others, the industry-wide risks and project-specific risks identified in the PFS and summarized above; risks related to the availability of financing on commercially reasonable terms; operations and contractual obligations; changes in exploration programs based upon results of exploration, including drill results; changes in estimated mineral reserves or mineral resources; future prices of metals; availability of third party contractors; availability of equipment; failure of equipment to operate as anticipated; accidents, effects of weather and other natural phenomena and other risks associated with the mineral exploration industry; environmental risks, including environmental matters under US federal and Idaho rules and regulations; impact of environmental remediation requirements and the terms of existing and potential consent decrees on the Corporation's planned exploration and development activities on the Stibnite Gold Project; certainty of mineral title; community relations; delays in obtaining governmental approvals or financing; fluctuations in mineral prices; the Corporation's dependence on one mineral project; the nature of mineral exploration and mining and the uncertain commercial viability of certain mineral deposits; the Corporation's lack of operating revenues; governmental regulations and the ability to obtain necessary licenses and permits; risks related to mineral properties being subject to prior unregistered agreements, transfers or claims and other defects in title; currency fluctuations; changes in environmental laws and regulations and changes in the application of standards pursuant to existing laws and regulations which may increase costs of doing business and restrict operations; risks related to dependence on key personnel; and estimates used in financial statements proving to be incorrect; as well as those factors discussed in the Corporation's public disclosure record. Although the Corporation has attempted to identify important factors that could affect the Corporation and may cause actual actions, events or results to differ materially from those described in Forward-Looking Information, there may be other factors that cause actions, events or results not to be as anticipated, estimated or intended. There can be no assurance that Forward-Looking Information will prove to be accurate, as actual results and future events could differ materially from those anticipated in such statements. Accordingly, readers should not place undue reliance on Forward-Looking Information. Except as required by law, the Corporation does not assume any obligation to release publicly any revisions to Forward-Looking Information contained in this news release to reflect events or circumstances after the date hereof or to reflect the occurrence of unanticipated events.